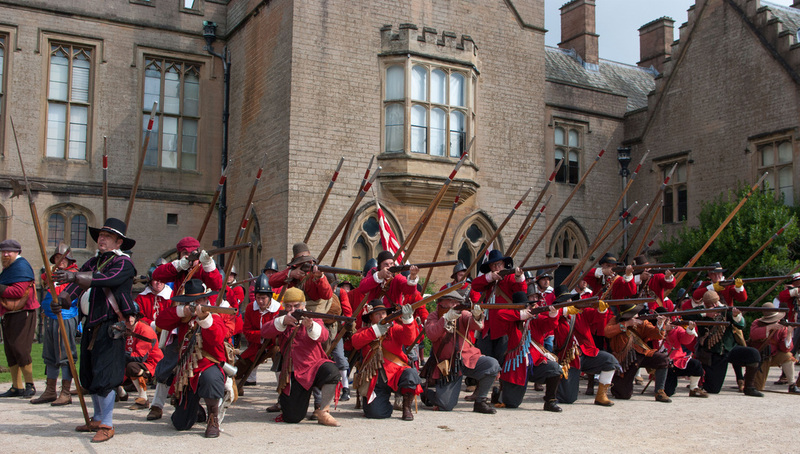 Today we portray a single company of the original 4th Regiment of Foote, The New Model Armie, 1645 - Captaine Charles O'Hara's (The 3rd Captaine's Company), and hope to honour their memory by our actions whilst wearing the famous red coat. Explore the buttons below to find out about Hammond's commitment to The Cittie of London Brigade, The Armie of Parliament, The Sealed Knot and the Memmingen Pikeniere. The Colonel Robert Hammond's Regiment of the 21st Century started in 1984 at the Battle of York. Formed as a specialist drill and lifeguard unit Hammond's quickly raised the bar for others to follow, with multiple wins in the annual drill competition - the Rose Bowl held at Nantwich every January. Hammond's also displayed a tenacious fighting spirit that has earned us the reputation as a 'hard but fair' unit to engage on the Battlefield. Our aim as a group is to use the equipment, knowledge and expertise we have to educate and inform members of the public about the period of the Civil Wars. If we can support events that raise money for charities and other good causes, then we are often pleased to help with minimal costs to cover our expenses. We also plan our own events, with a view to enhancing the reputation of the Regiment with local and national Heritage Bodies, district and county councils, private and public companies and we also honour the fallen of the Civil Wars by maintaining our own Annual Anniversary event at Naseby in June every year. Today we have over a hundred members, with members of all ages. We can offer our members military roles in pike, musket or artillery, Living History roles on our growing authentic campsite advised by some of the best qualified re-enactors in the Sealed Knot to make sure that you are supported in your search for a role; or just come along and support friends and family. We are a very democratic unit that has two layers of committees to arrange and organise the activities of the regiment. We have the Executive Committee who are elected by the members of the regiment and are responsible for the financial management and social life of Hammond's. Then we have a Military Committee (Milcom), which is made up of the officers and other representatives of the fighting side of the unit who are un-elected, and focus on the presentation and discipline of the Regiment. We are incredibly proud of our association with the other regiments in our brigade - the Cittie of London Brigade, in the Armie of Parliament, in the Sealed Knot. We are also honoured to be the 5th Company (Von Rheinach's) of the Memmingen Pikeniere, and are so proud of the friendship that has developed over the last twenty plus years, and we hope that we will remain closely allied to our Bavarian friends for many more years to come. Back to Who Are Hammond's?